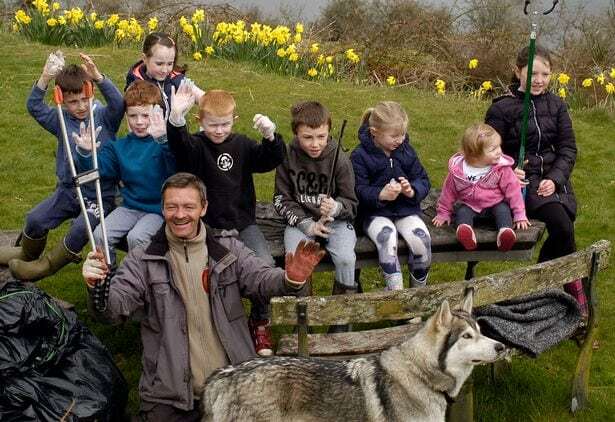 A litter picker who is walking across the UK on a five-year mission to Keep Britain Tidy has collected around 42 TONNES of rubbish – in 6,000 BAGS. 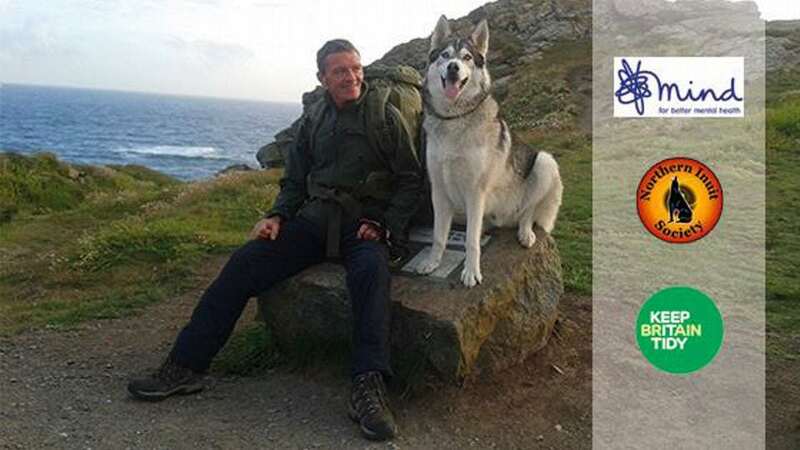 Wayne Dixon’s remarkable quest has taken him through outlying parts of Scotland and along the coast of Wales with his dog. 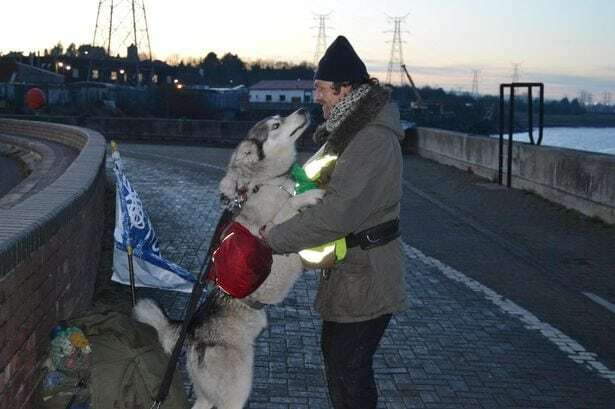 He carries a tent, sleeping bag, waterproofs, a stove and wind-up radio – and is accompanied by best friend Koda, a five-year-old Northern Inuit. His cause is capturing the public’s attention as he fundraises for mental health charity Mind while collecting rubbish to combat a “litter epidemic” across the country. Wayne believes he’s filled up around 6,000 bags of litter at a weight of roughly seven kg per bag. This equates to 42000kg – or 42 tonnes- the same as eight killer WHALES. The former support worker’s progress is being tracked by thousands of people on Twitter. He carries three litres of water and three days worth of food, living off a diet of Muesli, sausage rolls, sandwiches, peanuts and pasta. When it’s wet, he stays in a spot for up to two days and listens to his wind-up radio. He collects his rubbish and puts it in a big pile and rings the local council in whichever town he’s in who come and collect in. Wayne said: “If I’m in towns I can bin it quite easily but in villages I will pick up the rubbish and leave the bags under the village sign before ringing the council who collect it. “Liverpool was very bad for litter – but there are also really small villages that have a real problem like Garelochhead in Scotland. Dozens of kind-hearted people have spotted Wayne and invited him into their homes for food and shelter while confiding in him about difficult moments in their lives. On Monday, a woman in Sharpness, Glos, made him a big lunch with apple pie and cream for dessert after recognising him from a news report. She cried on his shoulder after revealing her husband had died a year earlier – a poignant moment for Wayne who lost his father to a sudden heart attack. “People are really opening up because I’m passing through their lives,” said Wayne who is walking to Bristol next along the River Severn. “Last night I got dropped off at Berkeley by an old mate who had put me up for two days at his home in Dursley. “Then I was sat on a bench in Sharpness overlooking the River Severn and there was a couple nearby who asked me what I was doing. “They invited me in for a hot chocolate and let me stay in there spare campervan. “Last year, I had a tough day in Scotland when it was raining while I was litter picking. “All of a sudden, a Land Rover pulls up with a 50-year-old bloke inside and his son. “He asked what I was doing and asked if I fancied some work. “It turns out he was organising Kelburn Garden Party, a festival at Kelburn Castle. Wayne, who has suffered with depression and lost friends to suicide, wants to destigmatize mental health issues while also raising money for dog charity Northern Inuit Society. A keen rambler from his youth, Wayne was inspired by his father John Dixon, the author of more than 30 historical walking guides who died from a heart attack in 2012. 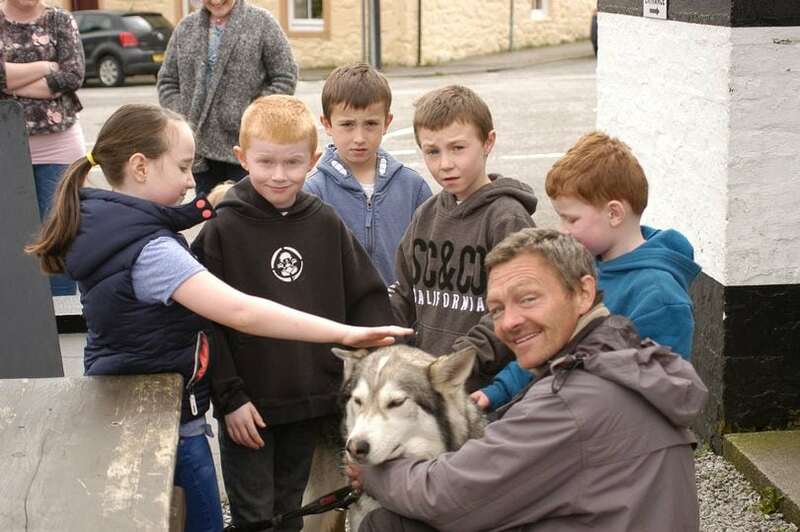 John suffered with bipolar – and 10 days before his sudden death bought Koda off her previous owner after she walked into a wood carving shop announcing that the dog was for sale. He said: “Dad was a walking guide and, growing up, he would take me on long journeys away from our hometown in Blackburn. “He also suffered with bipolar which is another reason why raising awareness of mental health is so important to me. “Ten days before he died, he was in a wood carving shop when a woman ran inside shouting ‘I want to sell this dog’ and dad took him straight away. 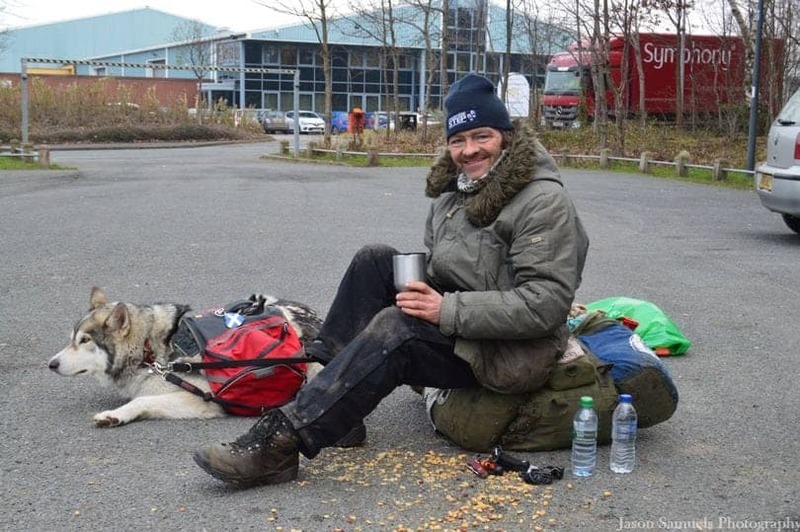 The adventure, which began 18 months ago in his home county of Lancashire, has seen him walk up to Kinlockleven, near Glencoe, Scotland, and along the Welsh coast. He has now crossed over the River Severn in Gloucestershire and will follow the water down to Bristol. Wayne is also sponsored by Ruffwear, who have supplied a rucksack and jacket for Koda, and Hi-Tec footwear.